Ah, the power of maps. When cartography has improved your life so much, it must be that you’ve found your true calling. From our little circle of UW friends to map enthusiasts all across the land, we’re all better off for you having found your way to the UW Geography department. Everybody wins! I know the feeling a little bit, although half the time maps are killing me instead. There’s nothing like a map for escaping the real world, and even if it’s done just for the escape, at least there’s usually something to learn in the process. You’re very brave to post that to a now somewhat-famous blog (thanks to your rivers-as-transit-systems diagrams!). Congrats for working up the nerve to do so. 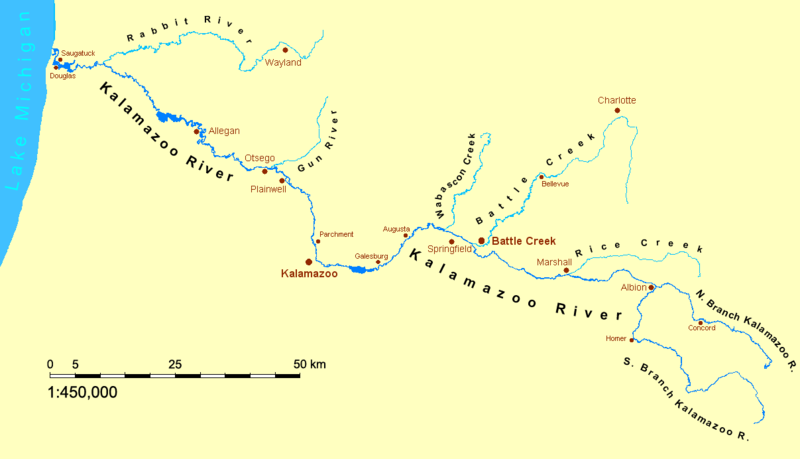 Daniel, thank you for creating the Kalamazoo River map. I would like to include it, with proper credit, in the paper that I’m writing about the building of the Trowbridge, Plainwell and Pine Creek (Otsego) dams on the Kalamazoo River. Of particular interest is the disappearance of the pioneer Village of Pine Creek, that was flooded by the flowage created when the Pine Creek Dam was built in 1903. You are free to use it, especially being that it’s on Wikipedia, but if you’d like I can give you something higher quality if you email me. That’s a great story, well-written, and thanks for writing this. James from selloutyoursoul.com, a site about my own attempt to find meaning after grad school. Thanks, James. I’m glad there is such a site. I remember at one point trying, and failing, to get a site off the ground called Grad School Dropout, which would have featured advice for people in my situation at the time. I remember wondering if I should drop out of school — but I didn’t know anyone who had or how it had worked out. I talked to my professors, but of course they all said, “Yes it was hard and I thought about leaving, but I stuck with it and now I’m here.” I wish I had had some of the opposite perspective at the time. This is a great post. I became a map hobbyist when very young, after my parents gave me What We Find When We Look at Maps. Of course I didn’t think of it at the time, but it was a refuge for me, wasn’t it? I never studied it formally — in fact, I was intimidated by the classes on offer at the University of Washington — but I still love maps of all sorts, and they’ve become very useful to me in my writing on local-historical issues. Fantastic post- a real pleasure to read. Thanks for sharing! I was also a Chemist working in the biochemistry field that saw no future… Did I really want to be dissecting rat parts for experiments until I was 65? So I waddled over to the local medical college entrance department and asked what forms I needed to fill out to get into medical school. That was 25 years ago…and now I’m a very happy eye surgeon, who still gets to use his chemistry occasionally, and am still in awe and wonder of the creation of the human body and universe (and the mapping and illustration of both). What a wonderful path your hobby as family navigator took you. I too got my interest in GIS probably as the kid directing the family through Chicago in the 70’s. What a great post–thank you for sharing a bit of your personal history. I also started my academic career in chemistry, but then I switched to biology. In ecology class, I was much more interested in making data charts than anything else. It wasn’t until I discovered the fields of environmental modeling, and GIS, that I found my passion for map making. It is really great when your interests and career mesh in such a strong way–for everyone. Pingback: Two Personal Geographies of Education and One Awesome Painting « h-5inc. Thank you for posting this story, it was exactly what I needed to read today. I am going through a very similar thing right now, as I am in the final year of a PhD in Archaeology (my childhood dream job) that feels more like a long, bitter defeat than the blissful culmination of my lifelong ambitions. Your story gives me hope that, whether I finish this course or not, there may still be a happy future to look forwards to, as long as I am willing to make the effort to find it. Again, thank you. You are most welcome. It is gratifying to know that I can be of some help to someone. Thanks for sharing that post. It was very open and honest of you to explain why maps mean so much to you. A very inspiring story. Wow, your story is very encouraging and I feel that I’m on a similar journey. Thanks for being so honest about all of your feelings and struggles with depression. I think that’s part of what makes things feel difficult…the isolation of feeling that others haven’t faced the same odd mix of struggles to find the right path. I’m 50 yrs old, I was a ‘stay-at-home’ mom while my kids were young. I returned to school in my early 40’s to get an MS in Computer Science. After graduating, I worked as a software developer for 3 years and it was extremely depressing for the same type of reasons you described. I gathered the courage to quit my job, I’m in the process of starting my PhD studies, but I am now having doubts whether this is the right path. I am a creative soul, interested in doing info vis research and teaching programming to visual artists…however my University doesn’t have faculty interested in my area of research…so the lack of peers and mentors makes it difficult. I feel extremely fortunate that I’m finding blogs such as yours for encouragement…The important thing I take from your story is to keep listening to my heart…to keep searching for the right ‘fit’…..I feel that is the most important thing I can do, and I’m working to move beyond the fears that sometimes overwhelm me. Your story is inspiring. Thanks for sharing. Daniel, You know who else is a K grad and cartophile? Larry Bell, the head of Bell’s Beer/Kalamazoo Brewery fame. I think you should talk. Daniel, thanks for your honest and beautiful description of your path. I suspect anybody with the maker fire can relate to your sentiments and I appreciate your sharing with us. You’re an wonderful cartographer, for sure, but your ability to inspire makes you more than that. Omg! Yer my religion right now. I get a sense of humility that is comforting and inspiring. Thank you for that. Thanks Twitter! Happy 10th anniversary, Daniel! I, for one, am very glad you make maps. I’m really happy that you found your passion! Love your typewriter-created map of Lake Michigan! Be well bro.